If it were easy to transform, everybody would do it. So why don't they? Because they fall in common traps along the way. Here's your roadmap around the biggest three culprits! Your New Year's Resolution this year was a doozie. After feeling inspired by reading seemingly everybody else's incredible transformation story, you decided it was your time. You spent days scouting out the perfect workout program, made a list of everything you couldn't eat (and what a list it was! ), told everyone your plans, and then wiled away night after night tweaking the details on your fitness app. Fast forward two months, and that after-picture isn't so vivid in your mind anymore. The image in the mirror says you barely changed at all. You started off strong, but then began falling into your old habits, going to the gym less than you'd planned, and just got burned out. Now you're starting to suspect—yet again—that perhaps a transformation isn't in the cards for you. Why do we fall short in our most cherished goals? There's no simple answer, since we're all different in terms of our driving forces and individual psychology. But there are common themes, such as setting goals that are far too big or drastic for the timeframe, or developing an all-or-nothing mentality. I offer an alternative viewpoint that can drastically impact your results over what remains of this transformative year—and there's plenty left, by the way. My three-point plan won't give you a magic formula for what rep scheme to use or what macros to ingest to melt away your former self, but if used correctly, it will drastically impact the results you achieve and leave you ready to set some new goals next January. When setting goals, most people shoot for the stars. This is great, and I encourage my clients to aim high. If you are inspired to transform by someone else's successful transformation, that "eyes on the prize" motivation is crucial to keeping you excited through the long, repetitive work of a transformation. However, I also advise people to be realistic about what they want. If you have 50 pounds to lose to hit your goal weight, don't expect to drop all of it in just 3-4 months. This doesn't mean that such a drastic weight loss is impossible—on the contrary, it's very possible—but obsessing over a big, round number may not be the best way to achieve it. If you still see your old weight staring up at you from the scale, it's time to break down your lofty goal into more realistic chunks. Do you think you could manage a 1-2 pound per week loss for the next few months? I bet you could. Once you achieve this goal a few times, you'll find a rhythm in your program and the weight will add up more quickly than you think. Once you lose the first 10-15 pounds, weight loss often slows down. It's a natural process, because once you weigh less, you burn less energy. 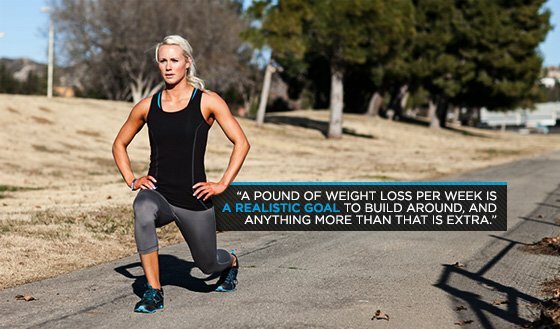 So realistically, you should expect a slower rate of loss the closer you get to your goal. A pound per week loss is a realistic goal to build around here, and anything more than that is gravy (not literally). Understanding how this process works gives you an idea of what to expect, and how to stay clearheaded as you navigate toward the end goal. "Yeah, but I want it now!" you say. I get it. But understand that your long-term health and well-being are well worth the time involved. If, by some trick of self-denial and pharmaceutical tinkering, you are able to magically wake up skinny one day, you're far more likely to wake up fat soon after. You don't want that. So prepare yourself for a journey. Look at those transformations, and you'll consistently see diet listed as the hardest thing for most people to master. It's not because they don't know what to eat, or when to eat. It's because it took them a long time to learn how to bend a diet without breaking it. Unless you're an athlete who has to make weight for a meet, missing a meal here or there is not the end of your long-term changes. Focus on establishing habits you can maintain for a lifetime. No one ever got fat by enjoying 2-3 meals per week that were outside of their healthy meal plan; they fell out of shape when those 2-3 bad meals per week turned into 2-3 per day. The lesson here: contain the explosion. As long as you stay active and aware of your daily food choices, you have the mindset it takes to get to your end goal. Simply being aware that food is a choice is a huge improvement over most people's mindset. Don't mistake feeling guilty all the time for awareness. Given how long it takes to transform a body, I guarantee that unexpected circumstances will throw a wrench in your dietary diagram here and there. More often than not, these wrenches will come in the familiar form of friends and family. Should this make them the enemy? Not if you want to enjoy your life, or have actual people (as opposed to online avatars) around to compliment you on your post-transformation body. The key is to reframe the issue. Realize that the act of enjoying food in good company is good for you psychologically. It's nourishment for your spirit, and your spirit is the motor that will ultimately get you to the end of a transformation. If you know you're going to a birthday party Saturday evening, do you best to follow your diet leading up to that day, and then enjoy some goodies in moderation. That's right: enjoy them. It's just one meal and one day. Tomorrow is a new day with new choices. Repeat those two sentences as often as necessary. If you are anything like me, your diet and training are important to you. I plan a lot of my day around food and training. However, that doesn't mean my plans don't land in the gutter sometimes. There are times when you get sick, or injured, and you have to take time off from the gym. There will be weeks or months when you travel so frequently that you can barely watch your diet and can't train like you plan. Guess what? It is OK. Learn how to press reset. What does this mean in action? Do not just lie there in bed trying to convince yourself that all isn't lost. Realize that overcoming challenges enhances the secret skill that defines the physically fit: to find a way to keep moving forward. Shoulder tweaked? Work your legs and lungs. Calves so dominated by DOMs that you can barely walk? Do pull-ups. Did a plantar fasciitis flare-up knock you down? You can always work on your core. 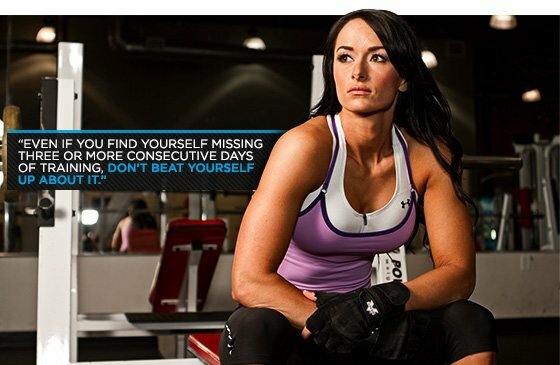 Even if you find yourself missing three or more consecutive days of training, don't beat yourself up about it. Close your eyes, breathe, relax. Think of your life as an arrow that always points ahead. Then get back on track the following day. One or two days of going off your diet or training doesn't have to turn into a weeklong binge or training hiatus. Life is uncertain, which means training is uncertain. It doesn't have to negatively affect you. If you catch yourself in a pattern you don't wish to be in, stop and press reset. Don't waste any time being mad or upset with yourself. Just keep going. You can always move forward.